Over the next three months, Treasury anticipates increasing the sizes of the 2-, 3-, and 5-year note auctions by $1 billion per month. As a result, the size of 2-, 3-, and 5-year note auctions will increase by $3 billion, respectively, by the end of October. In addition, Treasury will increase the auction size of the next 2-year FRN auction by $1 billion in August. Finally, Treasury will increase auction sizes by $1 billion to each of the next 7- and 10-year notes and the 30-year bond auctions in August, and hold the auction sizes steady at that level through October. Not surprising given Washington DC endless appetite for spending. A general rule of thumb is that whenever sovereign yields spike by over 10 basis points, it is a big deal. So Italy and Greece 10-year sovereign yields spiking over 40 basis points this morning is a big deal! The third PIG (Portugal) is up 11.3 BPS. For the 2-year sovereign debt, Italy is up over 153 BPS. a) The 2016 low for the 10-year yield was almost the same as the 2012 low, creating what appears to be a long-term double bottom or base. b) The 10-year yield has broken above the top of a well-defined 30-year channel. 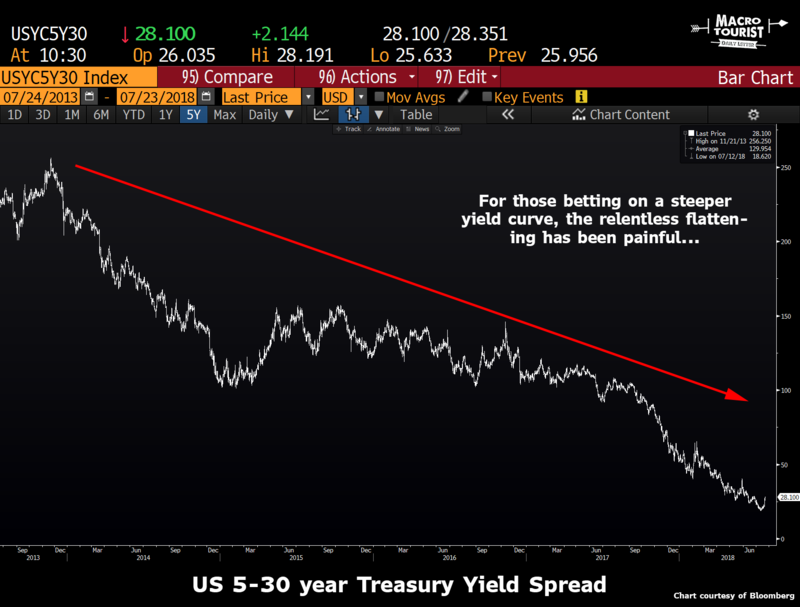 c) By moving decisively above 3.0% last week the 10-year yield did something it had not done since the start of its secular decline in the early-1980s: make a higher-high on a long-term basis. The last time that the S&P 500 dividend yield was below the 3-month Treasury bill yield was back in February 2008, before both Lehman Bros and Bear Stearns collapsed. And before Fannie Mae and Freddie Mac were placed into conservatorship on September 6, 2008. But yes, for the last several trading days the S&P 500 dividend yield has been BELOW the 3-month Treasury bill yield once again. Oddly, Fannie Mae and Freddie Mac are STILL in conservatorship with their regulator, FHFA while Lehman Brothers and Bear Stearns are but a grim reminder of the financial crisis. On a side note, the actor to the left of Ryan Gosling in the film “The Big Short” is a former student of mine. The US Treasury 10-year yield has pieced the 3% resistance level … again. And then promptly feel below 3% resistance level again. I try to stay away from making predictions. I don’t see the upside. If I am right, then yay! But after the fact, predictions often look obvious (hindsight bias) and it is hard to get much credit for them. By the same token, if I am wrong then the ex post facto viewer shakes his head sadly at my obtuseness. Sure, I can make a prediction with a very high likelihood of being true – I predict that the team name of the 2019 Super Bowl winner will end in ‘s’ – but there’s no point in that. This is one of the reasons I think analysts should in general shy away from making correct predictions and instead focus on asking the correct questions. But on occasion, I feel chippy and want to make predictions. So now I am going to make a ridiculously specific prediction. This prediction is certain to be incorrect; therefore, I just want to observe that it would be churlish of you to criticize me for its inaccuracy either before or after the fact. Ten-year Treasury rates will break through 3% for good on May 10, and proceed over the next six weeks to 3.53%. As of this Thursday, year/year core CPI inflation is going to be 2.2% or 2.3%, and median CPI over 2.5% and nearing 9-year highs. At that level of current inflation, 3% nominal yields simply make no sense, especially with the economy – for now – growing above trend. Two percent growth with 2.5% inflation is 4.5%, isn’t it? There is also no reason for 10-year real yields to be below 1%, so when we get to that 3.53% target it will be 1.08% real and 2.45% expected inflation (breakevens). The hot topic in monetary economics today (hah, if it’s not an oxymoron to say these terms together!) is whither interest rates. The Fed in its recent statement said the risk is balanced (the debunked notion of a tradeoff between unemployment and rising consumer prices should have been tossed on the ash heap of history in the 1970’s). The gold community certainly expects rapidly rising prices, and hence gold to go up, of course. Will interest rates rise? We don’t think it’s so obvious. Before we discuss this, we want to make a few observations. Rates have been falling for well over three decades. During that time, there have been many corrections (i.e. countertrend moves, where rates rose a bit before falling even further). Each of those corrections was viewed by many at the time as a trend change. They had good reason to think so (if the mainstream theory can be called good reasoning). Armed with the Quantity Theory of Money, they thought that rising quantity of dollars causes rising prices. And as all know, rising prices cause rising inflation expectations. And if people expect inflation to rise, they will demand higher interest rates to compensate them for it. The quantity of dollars certainly rose during all those years (with some little dips along the way). Yet the rate of increase of prices slowed. Nowadays, the Fed is struggling to get a 2% increase and that’s with all the “help” they get from tax and regulatory policies, which drive up costs to consumers but has nothing to do with monetary policy. Nevertheless interest rates fell. And fell and fell. Will Rising Bond Yields Send Stock Prices Tumbling? Conventional Wall Street wisdom says “rising rates are bad for stocks.” Let’s put that belief to a test. One of the big financial news stories on April 24 was that the 10-year Treasury yield hit 3% for the first time since 2014. The other big financial news story was that the DJIA closed 424 points lower on that day. As you probably know, the conventional wisdom on Wall Street is that investors will sell stocks in favor of bonds when yields reach an attractive level. 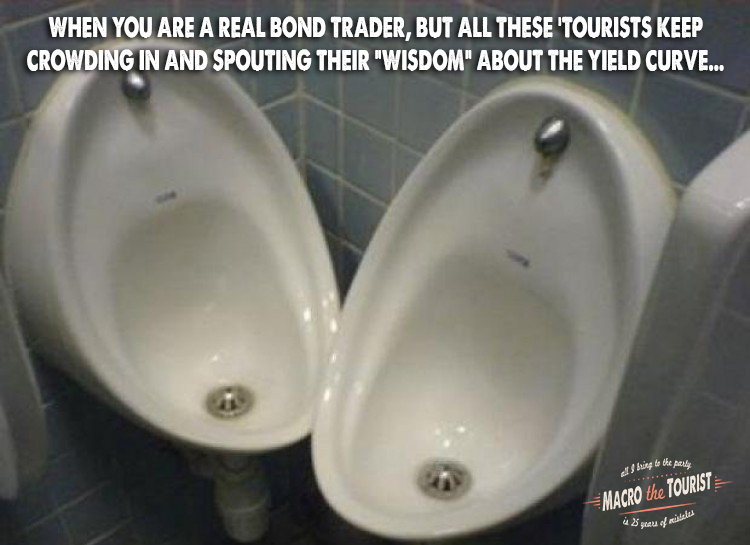 So, it’s not surprising that many pundits blamed the DJIA’s triple-digit decline on rising bond yields. But, is the conventional wisdom that says higher bond yields will send stocks lower correct? Well, our research reveals that there is no consistent correlation between interest rates or bond yields and the stock market. 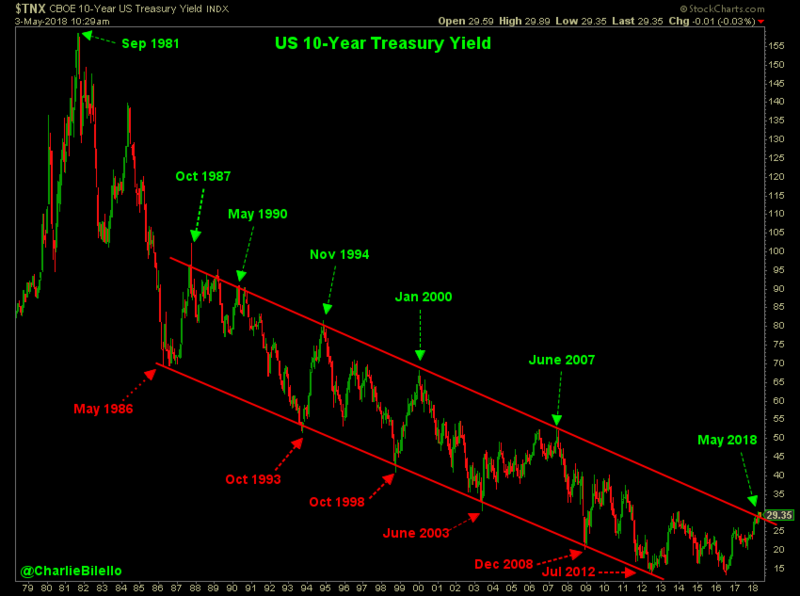 Continue reading Will Rising Bond Yields Send Stock Prices Tumbling? What Is the Relationship Between Interest Rates, Growth and Inflation? While you often hear commentators suggesting there is a strong relationship between bond yields and the real economy, the evidence seems to be lacking. 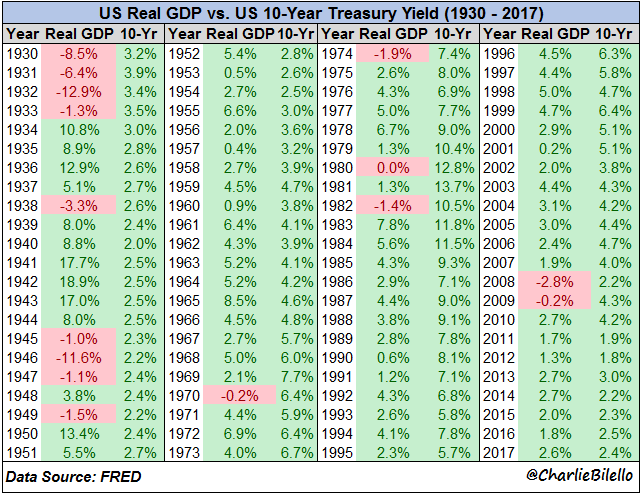 Since 1930, the correlation between annual change in real GDP and the 10-year treasury yield is effectively 0 (-0.05). Continue reading What Is the Relationship Between Interest Rates, Growth and Inflation? Finally, the US Treasury 10-year yield has pierced the 3% barrier and NOT immediately dropped back. The 10-year yield stands at 3.03%. How about the 30-year mortgage average? The Bankrate 30Y mortgage average rate is now 4.50%.